Log Huts of the Muhlenberg Brigade at Valley Forge. Four new huts were constructed in the summer of 2015, including one large officer cabin; all will include interpretive exhibits about the encampment. Cost for four huts in 2015, $122,000. Cost in 1777, hard work and a forest. Want a lot more Independence and Revolutionary War era history, check out all of the historic sites in nearby Philadelphia. George Washington at Valley Forge. Courtesy National Archives. "We have this day no less than 2,873 men in camp unfit for duty because they are barefooted and otherwise naked." - George Washington, December 23, 1777. Photo above: Recruiting poster from World War II, gives an indication of how the nation viewed the soldiers of 1777-8, ... resourceful and willing to sacrifice. Source: National Archives. 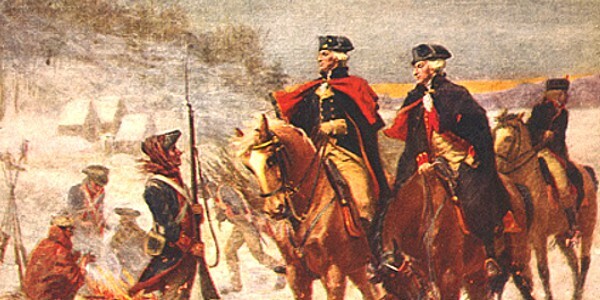 Right: Washington and his troops around the headquarters area. Source: Library of Congress. 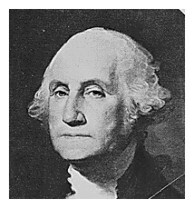 It was not the intention of George Washington to encamp along the Sckuylkill River west of Philadelphia with the British Army in possession of the nation's capital, Philadelphia. He had spent the better part of the fall of 1777 in losing battles with the British at Brandywine and Germantown, plus a good amount of feint and march, attempting to forestall their progress to occupy Philadelphia and Reading where a large amount of Federal supplies were stored. Somehow as Washington bridged the gap between those locations, the road to Philadelphia became open, and now, he was forced to winter on the plains of Valley Forge, in 2,000 rough log huts that would test whether a man could withstand one of the coldest winters in memory and live to fight the next spring. For many men in the 11,000 strong Continental Army at Valley Forge, this would be their last winter. Valley Forge would see to that for nearly 2,000 soldiers, although the reason for their demise was mostly disease. Different than most battlefield oriented parks, Valley Forge is as much memorial as location to recall activity. 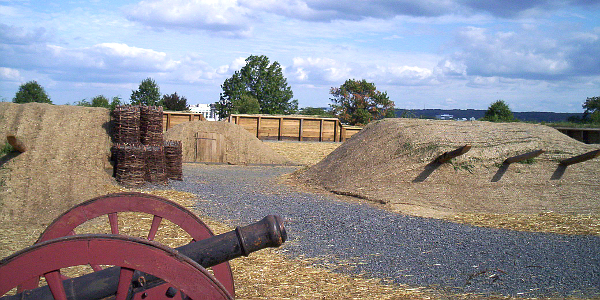 It was the location of a winter encampment where the men of the Continental Army trained under General Baron von Steuben and became an efficient fighting force, and while that should not be overshadowed and lessened in importance, much of the Valley Forge story centers around the harshness of the camp and the loss of life while there. With spring, the troops of Washington that had endured those harsh conditions left Valley Forge an improved force, with a new alliance with France in force as of May 1778. With the French recognition and their impending arrival, the British army evacuated Philadelphia in June 1778, with George Washington marching out of his Valley Forge camp on June 19 of that year to regain Philadelphia and follow the British into New Jersey. Von Steuben and Formation - Although most of the Valley Forge encampment was spent trying to outlast the winter and overcome disease, it was the system of field formations developed and perfected by the Prussian general which had the most lasting effect on the fledgling nation. When the battles of 1778 would occur, mostly in New Jersey, the efficiency of the soldiers in battle had been greatly improved. The Continental Soldier - Beginning in 1777, the majority of men in the Continental Army were three year recruits, or for the remainder of the war, if it lasted more than three years. They had been engaged in battles throughout southeast Pennsylvania in the fall of 1777 from Brandywine to the Battle of the Clouds, Paoli, and Germantown, marching between the Delaware border toward Reading into Philadelphia and eventually wintering in Valley Forge as the British commanded the city. Image above: General George Washington and the Marquis de Lafayette on horseback at Valley Forge. Painting by John Ward Dunsmore, 1907, courtesy Library of Congress. 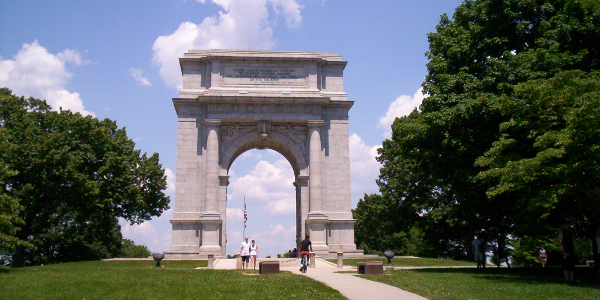 Below: Valley Forge's National Memorial Arch. A visit to Valley Forge has been undergoing a dramatic change with increased interpretation at many areas, not only the heavily visited Muhlenberg Huts or Washington Headquarters. The park is much more than that or a place to take a walk, as the suburban nature of the location has pushed toward recreation as well as history. Talks and other programs are available throughout the year, and a visit to the Washington Chapel, the final stop on the tour road, should not be missed. A visit to Valley Forge on your Philadelphia or Pennsylvania vacation is a must if you wish to understand sacrifice, ... sacrifice for an ideal that had yet been tried, but would eventually lead to the first democratic nation that would fulfill the destiny proclaimed in the Declaration of Independence and later codified in the Constitution. 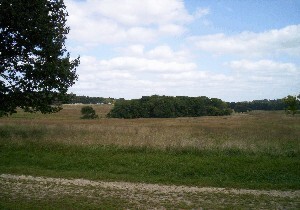 The Grand Parade Ground - In the open fields of Valley Forge, General Van Steuben created an effective fighting force among the men who lasted the winter camp. 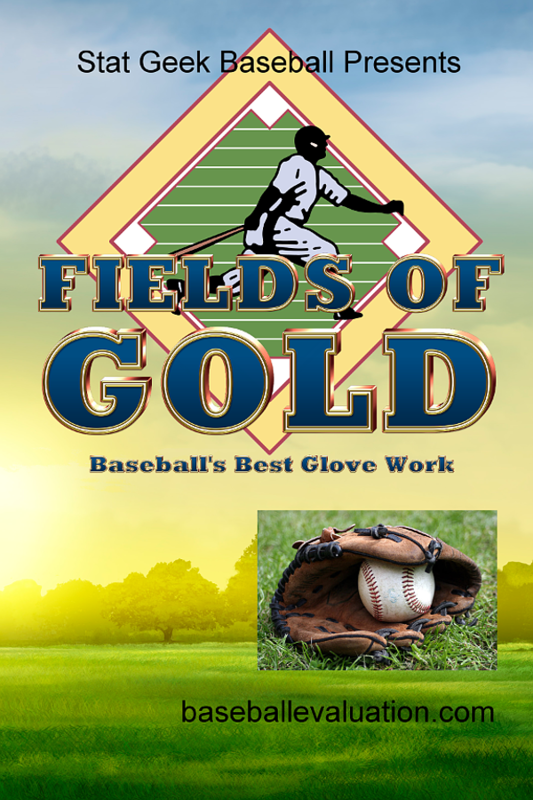 Although less famous than the log huts that dot the site, it was perhaps in this field that the most lasting import of the Valley Forge history was made. 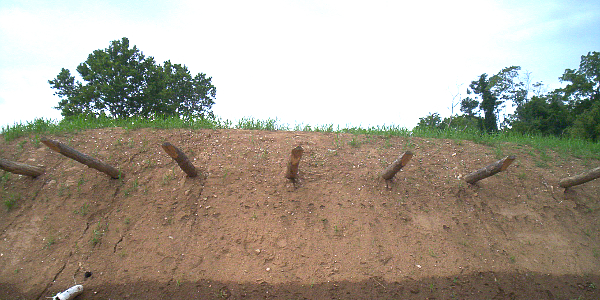 The training here gave Washington's men the chance to win the war. Soldier's Quarters - The log huts of the Muhlenberg brigade are examples of the two thousand cold structures that dotted the avenues of Valley Forge and were home to the eleven thousand men encamped there. Beyond these huts, which they constructed upon arrival, the men also dug redoubts and built a bridge across the Schuylkill River. The National Memorial Arch - Dedicated in 1917 to commemorate the value and sacrifice that the men of Washington exhibited during their stay at Valley Forge, the Memorial Arch serves as the largest and most visible reminder to the many prayers for sustenance and independence that raged throughout the Revolutionary War. Note Through Spring 2020 - The main Visitor Center at Valley Forge will be closed for reconstruction, but Visitor Services, the Encampment Store, and Programs will be housed in a Temporary Visitor Center and Tents in the Main Parking Lot Area. Summer Tours and Ranger Programs will still be ongoing. 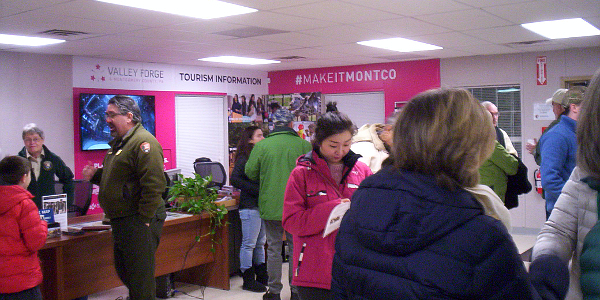 Photo below of Interior of Temporary Visitor Center. 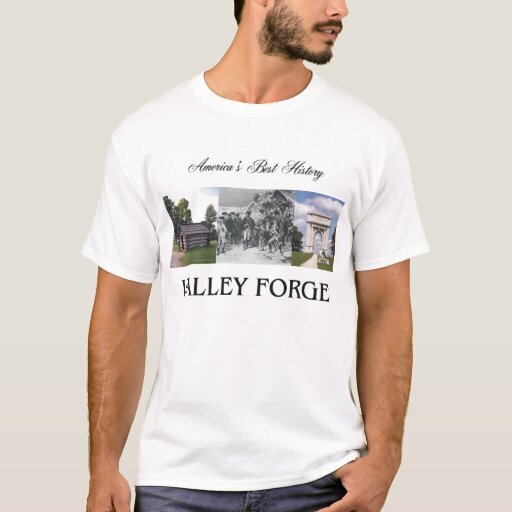 Valley Forge T-Shirts and Souvenirs. Official gifts from Americabesthistory.com provided at Teepossible. 1. Dip inside a log hut and close the door. Now imagine yourself stuck inside the small, drafty hut with cold winds seeping through the cracks. Do that for three or four months, then add in cold training to become a better fighting force, and you get the idea of what life was like here. 2. Take the ranger guided walk around the restored Washington's headquarters area. Although this was certainly not a Mount Vernon type structure, there was a grand difference between being a typical soldier stuck inside the log huts that dotted the entire landscape of the park at that time and being a general in the Continental Army. 3. Walk up to the National Memorial Arch and take a look over the landscape. What you'll see is almost a recreational atmosphere of children playing, kites flying, joggers jogging, and unfortunately, a skyline in the background for the King of Prussia condominiums. Take a breath and realize that if it was not for Washington's men giving democracy and freedom a chance with their lives here at Valley Forge, none of that would have been possible. 4. 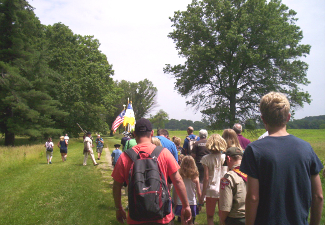 Take advantage of the special walks and talks, such as the Soldiers Walk Into Camp program in winter, around the December 19 date of the actual time Washington got to Valley Forge, or the Soldiers Walk Out, around the June 19 date Washington left Valley Forge, prompted by the British evacuating Philadelphia. Yes, they were there six months, all the time while the British dined in Philly. And why did the British finally leave Philadelphia? Well, they were afraid, after the USA alliance with France that France would blockade the Delaware Bay and not allow them to leave. Thanks, France. Photo above: Washington's headquarters today. Open to visit with guided walks/talks during summer months. The Valley Forge National Historic Park Visitor Center, off Routes 422, 23, the Schuylkill Expressway & Pennsylvania Turnpike, contains exhibits and an 18 minute orientation film. 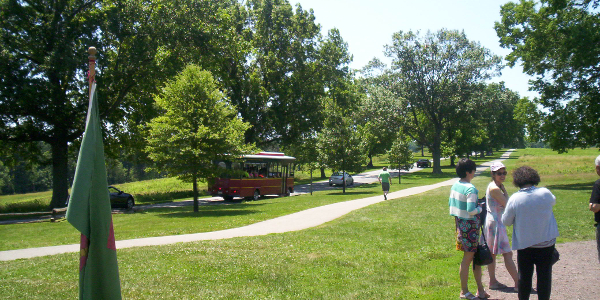 In the summer, you can drive a self-guided tour with nine stops around the park or board one of the (fee charged) shuttle buses for a guided tour. Muhlenberg Huts - Although there are no longer the two thousand huts that once dotted the landscape, you can visit the hundreds of examples of the soldier log cabins, as well as several of the stone homes of the officers on your tour around the grounds. 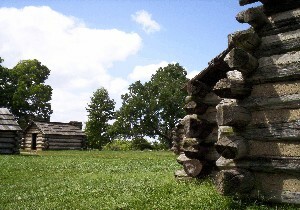 New log huts have been built with exhibits in the Muhlenberg hut area, financed by the Society of the Cincinnati (descendents of Washington's officer corp), the National Park Service, and the Friends of Valley Forge Park. The Valley Forge hut brigade completed the huts once major construction was complete. National Memorial Arch - Dedicated in 1917, this large stone arch was originally to be one of two arches built to honor Washington and Von Steuben. Washington Headquarters Area - Original home structure used by Washington during the encampment, statue of Washington, and exhibits in the restored (non period) train station. Camp activities are also demonstrated during summer months and also during special programs, and there are special walks and talks, such as the Soldiers Walk In to Camp, December, and Soldiers Walk Out of Camp, June. Photo above: Grand Parade at Valley Forge. The private musuem on the entire American Revolution has now opened at 3rd and Chestnut Streets on the site of the former Independence Park Visitor Center. It's a great place to get the overview of the war, the only full American Revolution museum in the United States. 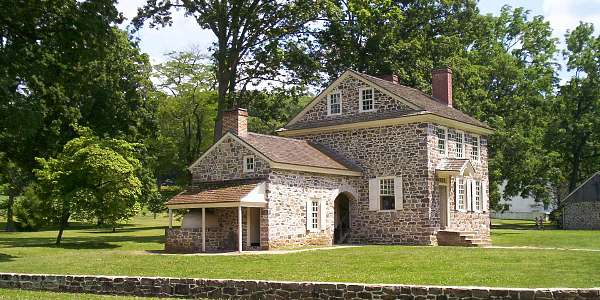 The museum was originally slated to be built at Valley Forge, but the land was exchanged for the current site within Indepedence National Historic Park in Philadelphia. Lodging in the area of Valley Forge and King of Prussia, the town where the park is located, is plentiful. There is no camping within the park, but there are locations within thirty to forty minutes west that should be appropriate, including French Creek State Park. Check with the local tourist bureau for more options that might suit your needs or with your favorite online lodging site such as Expedia for the lodging type of your choice. Photo above: Washington's Prayer - This engraving by John C. McRae of Henry Brueckner painting shows the general in the woods of Valley Forge asking for guidance. It was first published in 1866. Source: Library of Congress. Photo above: Trolley tour and visitors at Valley Forge National Historical Park. Photo middle: Continental Soldiers Walk Out of Camp Ranger Tour, June. Photos below: A reconstruction of the wood/earthen Fort Moore near the Muhlenberg huts, new in fall 2016. 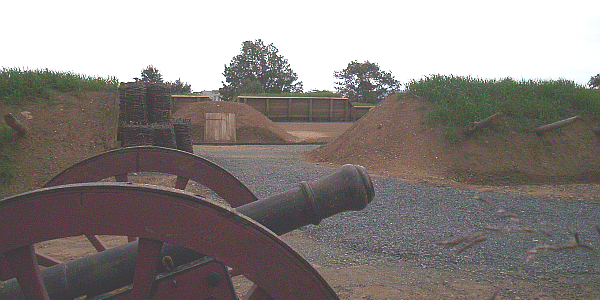 Front facing Philadelphia; rear with cannon facing west. Want a unique little take on Valley Forge history before the encampment, then check out the Battle of Valley Forge, which occured on September 18, 1777, three months before General Washington marched his troops there to stay the winter. Hint: it almost cost the current United States its favorite musical, Hamilton.